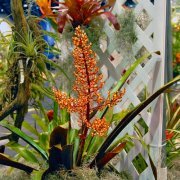 Congratulations to the following winners of the 2013 Bromeliad Society/Houston show held at Mercer Arboretum on April 27-28. 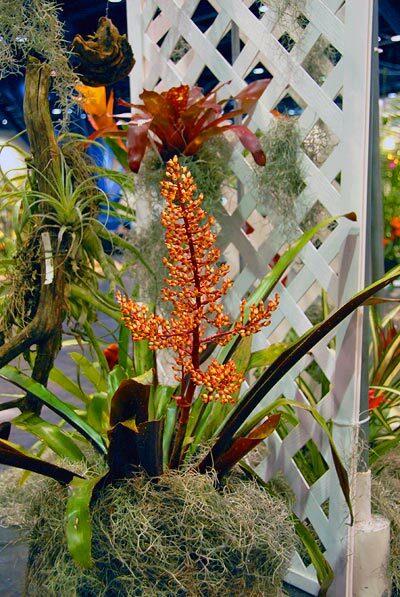 Mulford Foster Best in Show Horticulture, Steve Reynolds, Aechmea egleriana. Morris Henry Hobbs Best in Show Artistic, Allyn Pearlman, with the artistic arrangement, “Alice in Wonderland”. Winner of Hobbyist Sweepstakes, Rick Richtmyer. Best of Div. I, Pitcairnioideae, Dyckia ‘Heaven and Hell’, entered by Chris Nguyen. Best in Sec. 1A, Single Plant, Dyckia ‘Mercury’ X retzii v. rubra, Gene Powers. Best in Sec. 1B, Multiple Plants, Pitcairnia orchidifolia, Rick Richtmyer. Best of Div. II, Tillandsioideae, Till. complanata, Rick Richtmyer. Best in Sec. 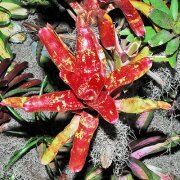 A, Single Plant, Till. ehlersiana, Margo Racca. Best in Sec. B, Multiple Plants, Vreisea erythrodactylon ‘Striata’, Rick Richtmyer. Best of Div. 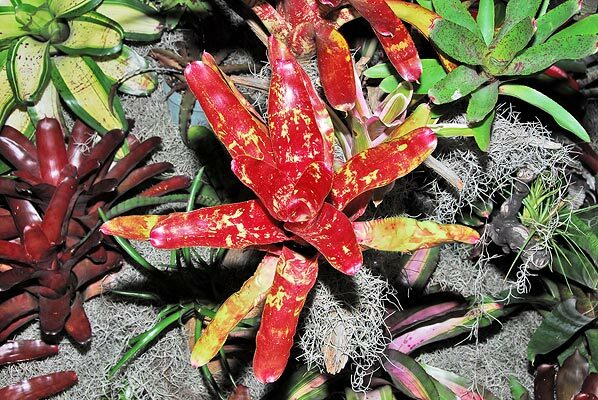 III, Bromelioideae, Orthophytum disjunctum, Steve Reynolds. Best in Sec. 3A, Single Blooming, Orthophytum harleyi, Cynthia Johnson. Best in Sec. 3B, Single Foliage, Crypt. warasii, Rick Richtmyer. Best of Sec. 3C, Multiple Blooming, Neoglaziovia variegata, Cynthia Johnson. Best in Section D, Multiple Foliage, Ae. contracta, Rick Richtmyer. Best in Div. IV, Intergeneric Hybrid, Orthotanthus ‘Blazing Bonsai’, Carole Richtmyer. Best in Sec. 4A, Neophytum ‘Purple Star’ X navioides, Rick Richtmyer. Best in Div. V, Horticultural Displays, Till. dasylirifolia ‘Proliferata’, Steve Reynolds. Best in Sec. 5A, Single Blooming, Till. fasiculata, John Schmidt. Best in Sec. 5B, Best Single Foliage, Ae. orlandiana ‘Snowflake’, David Whipkey. Best in Sec. 5C, Multiple Blooming, Till. ionantha ‘Mexicana’, ‘Fuego’ and ‘Rosea’, Wray Page. Best in Sec. 5D, Multiple Foliage, Till. funckiana, Rick Richtmyer. Best in Div. VII, Artistic Arrangements, “Mocha Mint”, Allyn Pearlman. Best in Sec. A, “Dreary Days”, Allyn Pearlman. Best in Div. VIII, Decorative Containers, Dyckia ‘Snowball’, Ray Johnson. Best in Sec. A, Crypt. ‘Jennifer’, Allyn Pearlman. Winner of Div. X, Section A, Judges, Ae. orlandiana, Ken Gardner.